On a normal day of hard work, Dr. Georgia Lorenz came across a job posting looking for a potential college president in Florida. She was already considering applying for a college presidency. “What could it hurt to call and ask if I was a viable candidate,” Lorenz recalled. Now this year Seminole State welcomes Dr. Lorenz as its new president. Lorenz previously served as vice president of Academic Affairs at Santa Monica College in California. She served 13 years in Academic Affairs and four and a half years as vice president. There were 23 academic departments that reported to her, and she worked directly with department chairs that managed each of those academic departments. She walks in the shoes of Dr. Ann McGee, previous Seminole State president of 21 years. In an interview with The Seminole Scribe, Lorenz was excited to talk about Dr. McGee’s achievements. “She helped make it the power house that it is today,” Lorenz said, referring to McGee. “We didn’t have four campuses when she started.” She said McGee took the college to new heights. Lorenz said she hopes to build upon that foundation. She may have come from Santa Monica, but Lorenz is originally from Cincinnati, Ohio. She brought her husband and dog with her to Florida. She also mentioned that her parents coincidently retired to Fort Myers Beach. Lorenz said she fell in love with Seminole State once she arrived. “It has exceeded my expectations and my expectations were already pretty high,” she said. Lorenz is carrying on the tradition of president’s walkabouts on the various campuses. 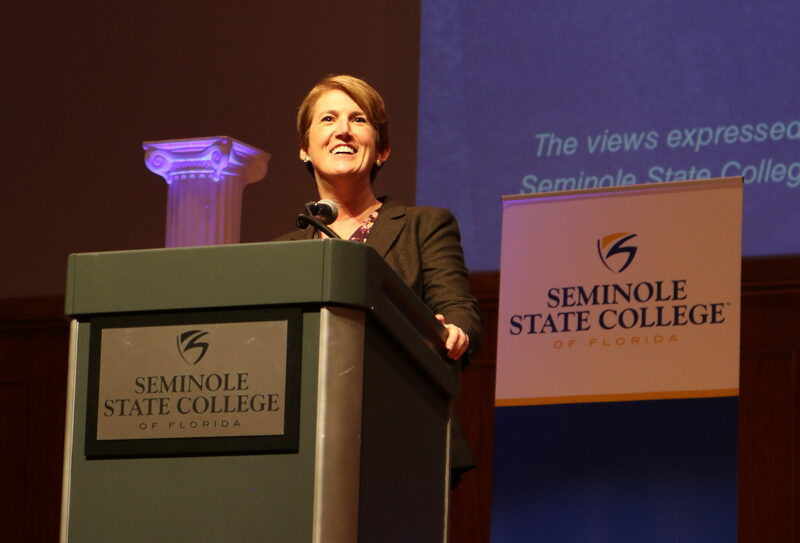 The goal is to engage with as many faculty members, staff and students as possible and to get to know Seminole State. She said she talked with a group of math faculty at the Altamonte campus on one of the walks. She also saw simulations in the nursing area. She met one of the standard patients that help in the simulations. The “patient” had fashioned her own bruise to make it appear she had a head injury. The nursing student was to come in and access what happened and how to help. Lorenz said she felt she had learned a lot in that day. At Heathrow, she talked to a custodian, who really liked Apple products. They talked about how he was looking forward to the famous Apple keynote speech when the company release new products. “I get to know people on a different level and get to see our programs in action,” Lorenz said. The administration is looking at the needs for each campus in Altamonte, Oviedo, Sanford/Lake Mary, and Heathrow. She said she wants to make sure they are coordinated in a way that benefits the whole college. She also mentioned that they were discussing a new strategic plan, that’ll involve each of the four campuses. “We need to think strategically about how we use our spaces, where we put programs, and how we help students find out about us,” Lorenz said. She talked about how she would like to incorporate a system they were working on at Santa Monica College called redesigning the student experience. The focus was mainly on the students: How they enrolled into the college, and how they experienced classes and advising for the school from the student point of view. “We talked about becoming a student-ready college, rather than making students ready for us,” Lorenz said. She thinks Seminole State already has a lot of good practices in place, but she wants to enhance it further.